ather all the items and take them to your ‘item box’. Avoid enemies. You have five bombs that can kill enemies (or yourself). The game has an interesting game concept, like a lesser version of Mappy. 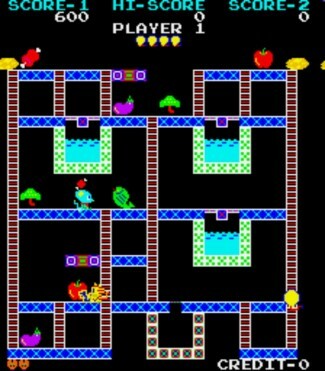 You are a purple mouse who has to climb the ladders to collect various objects (nine total), fish, apples, umbrella, meat, etc., and return them to the store at bottom center of the screen. Meanwhile you are pursued by cats and snakes. You can blow up the bad guys by pressing Fire to drop a bomb — pressing Fire again explodes the bomb — but there is a limited supply that is, fortunately, replenished each level. At the top of the left and right most ladders are two rocks; touching them drops the rocks on any of the bad guys climbing the ladders. The other way of disposing of the villains is to walk over one of the two, or three, trapdoors. Any pursuers drop into the water. On the higher levels the doors close again very quickly. An intermission sequence between the games is like a slot machine; you press the fire button to stop the reels and you get three changes to score some bonus points. The game’s colors are very strange and the graphics are pretty basic, but effective. The music is reptitive and it can become really irritating.